Well-off newcomers transform some city neighborhoods with their desires for improved housing and 'hip' businesses, but that also can make it too costly from some long-timers to live there. ny given afternoon, between the Kennedy Park public housing project and Interstate 295, a maze of industrial buildings turns into a concrete playground for the young and hip, sipping on craft beer, cappuccinos or kombucha. The state’s only Whole Foods – a beacon of gentrification – is on the other side of the corridor leading to the highway. Once best known for its racially diverse population, East Bayside in recent years has become a destination for beer tourists and coffee lovers, visiting the small-batch brewers and roasters that have set up shop there. Craftsmen and eco-friendly businesses also have caught onto the convenient yet affordable space. An influx of new residents could be close behind. Across the street from the public housing units, what was a cinderblock auto repair shop surrounded by a chain-link fence has been torn down to make way for an apartment building with 56 market-rate apartments. 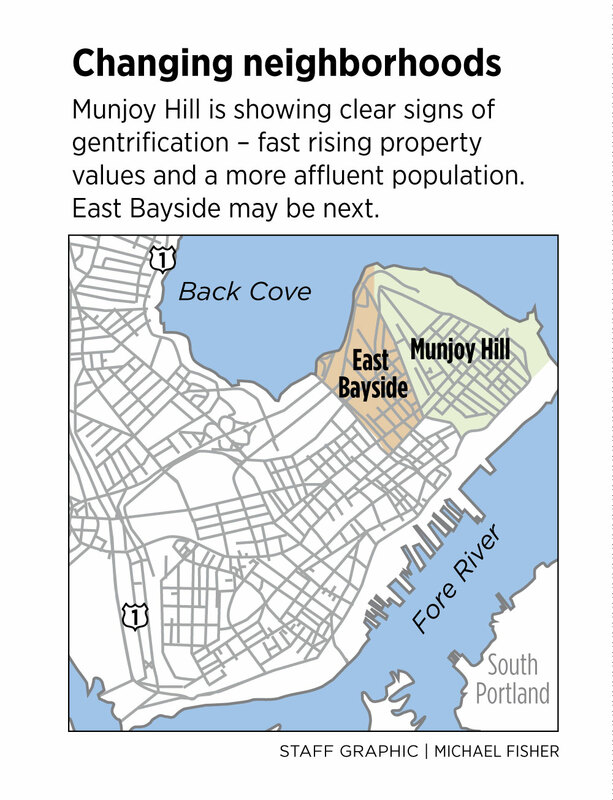 East Bayside could become the next front line of gentrification in Portland, if it isn’t already. Portland’s extremely tight apartment market is not only forcing renters to spend more of their incomes on rent. It’s changing the character and the demographic makeup of historic Portland neighborhoods. A rapid rise in property values and rents, accompanied by an influx of more affluent and more educated residents, is a familiar urban trend that can enrich a city and bring with it more services. But it also comes at a price, often paid by longtime residents who moved to their neighborhoods because they were affordable and who don’t want to leave even though they can no longer afford to stay. Portland is seeing both the good and the bad sides of gentrification. And, although some Portland neighborhoods are gentrifying faster than others, the trend is showing up in citywide demographic data. 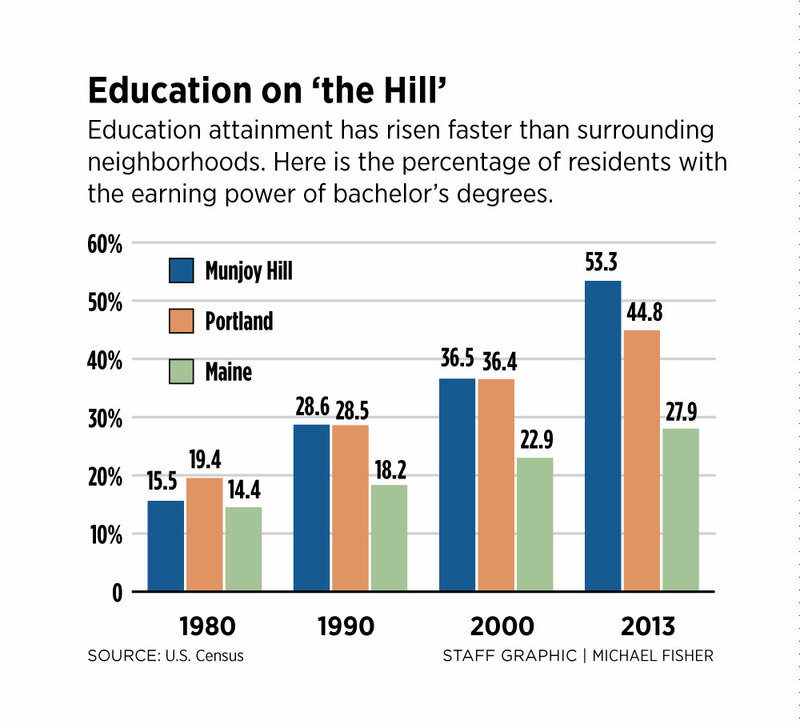 The proportion of city residents with bachelor’s degrees rose 39 percent between 2000 and 2014, to just over half the population, while Maine residents with that level of education only rose from 23 percent to 29 percent, a 26 percent increase, in the same time period. 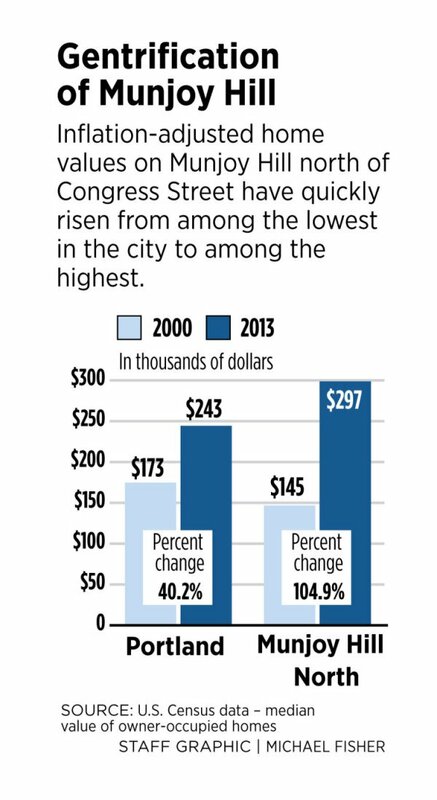 And while the state’s median household income was higher than the city’s in 2000, they’ve since switched places – the state’s median fell, when adjusted for inflation, while the city’s rose slightly to about $51,000 in 2014. Notably, the income growth in Portland hasn’t included renter households, whose median incomes declined from 2010 to 2014.
itting at the foot of Munjoy Hill, East Bayside – dubbed “Yeast Bayside” by the beer crowd that presides there – is showing all the telltale signs of that change. There are the artists and hipsters, bike shops and yoga studios, a Crossfit gym and a fermentory. But the data tells the story best. As of the latest U.S. Census data from 2013, East Bayside had the cheapest rents on Portland’s peninsula and lowest income and education levels in the city. But a Portland Press Herald analysis of market rents shows the average asking price for a two-bedroom this fall had already risen above the citywide average, to $1,605. And the median value of homes, which had been Portland’s lowest in 2000, grew 2.5 times by 2013, a rate matched only by adjacent Munjoy Hill, Maine’s most glaring example of gentrification taking hold. A couple of decades ago, the Munjoy Hill neighborhood was shunned by locals and considered by some to be unsafe for outsiders to venture alone at night. But that was before young people discovered its cheap rents, bringing a hip factor with them and spurring investment in a new 70-unit subsidized apartment complex in 2002. Shops and restaurants followed, trailed by the affluent from away who can’t imagine how a neighborhood with ocean views near the center of town was ever overlooked. Now a typical two-bedroom apartment there, at a current average market price of $1,829 a month, would eat up more than two-thirds of the median-income renter household in Portland, making it the most expensive – and least affordable – rental market on the peninsula. Rents are generally considered unaffordable when they rise above about one-third – 30 percent – of monthly income. By that standard, anything over about $800 a month is no longer affordable to the median-income renter household in Portland. hile the city’s population as a whole has become older and more diverse, Munjoy Hill’s has gotten younger and whiter. More Maine natives have left the neighborhood, and the education level of the residents rose from right around the city average in 2000 to having, by far, the highest percentage of college graduates than any neighborhood in Portland. But Munjoy Hill’s makeover is only part of a transformation that’s happening citywide. Popular attractions such as food trucks and a trail system have brought attention to the city’s longstanding assets – its working waterfront and wild surroundings – landing Portland on national lists as a destination for foodies, families, dog owners and outdoorsy types. And outsiders have taken notice. People “from away” now make up the majority of Portland residents, growing from less than 30 percent of the city’s population in 1980 to more than 50 percent in 2014. The overall population growth, however, has been much slower than in surrounding towns, which means Portlanders also are moving out of the city – probably because many could no longer afford to stay. Tom MacMillan, who ran for mayor by focusing on the struggles of city renters, is a personal example of gentrification. A 29-year-old education technician and graduate of Portland High School, he was renting a two-bedroom apartment in the West End for $1,000 a month with his girlfriend, their two cats and two dogs, when they got a notice last year from their landlord that they had to be out in six weeks. The West End neighborhood has been one of the hottest and more gentrified markets on the peninsula, according to the newspaper’s analysis of market rents. MacMillan and his girlfriend had to live with family for a month before finding a comparably priced apartment in East Bayside. But when they moved there in October 2014, there were rats, the bathroom door didn’t shut and the heat didn’t work, which wouldn’t be sustainable going into winter. They stayed for two months to make sure they got their security deposit back, before moving in with her parents on Munjoy Hill, where they spent the winter searching for an apartment and watching the rents rise. “What was $1,200 in December was $1,300 or $1,400 in the springtime,” MacMillan said. With one car between them, his girlfriend walks to her job on the East End as a home health care nurse, so moving out of town wasn’t an option. 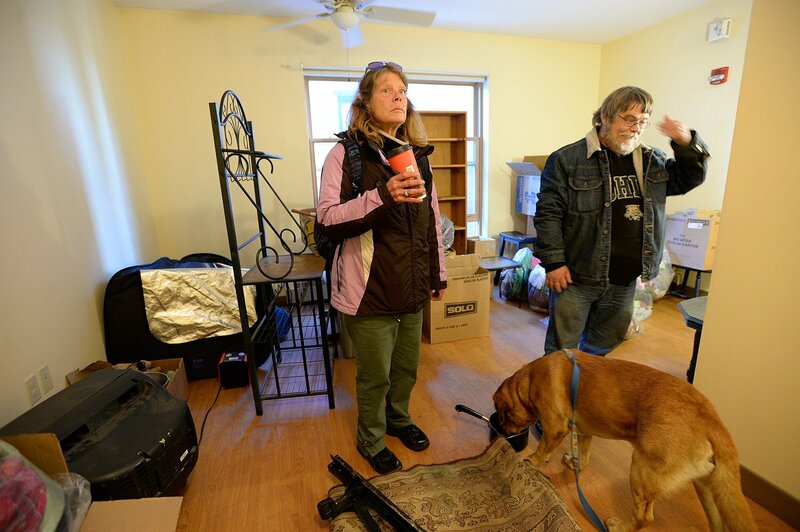 After accepting that they would have to pay more for a place that would meet their needs, the couple found a pet-friendly, two-bedroom apartment in Parkside for $1,350 a month, more than half of what they bring home on their combined pay of $25 an hour. The gritty neighborhood has become a last refuge for many workers and professionals trying to keep a toehold on the peninsula. Since moving there, they’ve eliminated their entertainment budget and taken on part-time jobs. “We grew up here. We’re not from away. We’re not people who found Portland to be a fun city and wanted to move here,” MacMillan said. Although he wasn’t elected mayor, putting a limit on annual rent increases is something he’d like to see the city consider. “These issues have just hit a breaking point,” he said. ith the demand for housing outpacing the city’s supply, the demographics of Portland renters have changed. While more rich and poor people are living in apartments in the city, the number of middle-class renters has declined. It’s a phenomenon known as hollowing out, and it is a byproduct of gentrification in cities around the country. Between 2000 and 2013, the number of Portland’s middle-income renter households dropped. The only two groups to experience growth were the households with very high incomes and the households with very low incomes, residents who often live in subsidized housing. 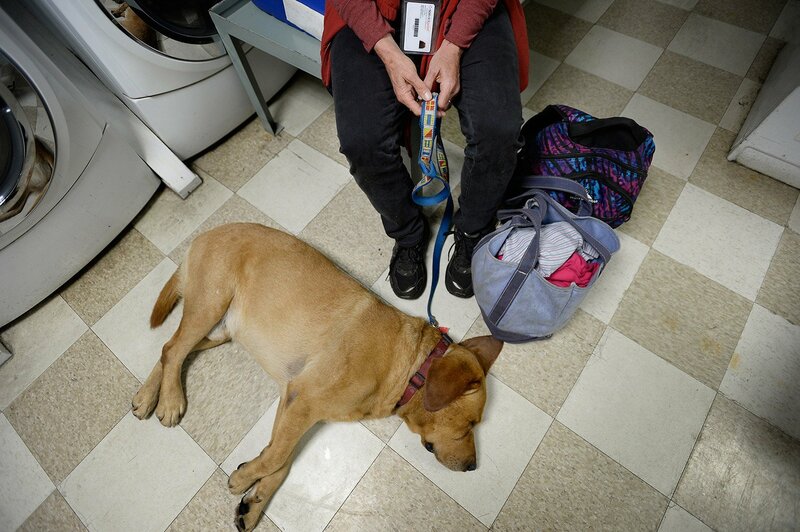 Low-income people are spending as much as 80 percent of their income on housing, leaving them little for anything else, said Bill Burns, coordinator of the adult resource center at Preble Street, which provides services to the homeless and extremely poor. That has led more people to use Preble Street’s Portland soup kitchen, where serving 200 people at one meal would be considered a busy day three years ago. Now, Burns said, having more than 300 people at all three meals is typical. Emergencies like job loss or a medical issue can quickly make it impossible to pay rent. “It’s a pot always waiting to boil over,” he said. And if a landlord decides to oust tenants in order to renovate, there might be no money left for a security deposit or any affordable apartments available, even for people who get rental assistance. Sometimes that leaves families sleeping in their cars. Also, with incomes dropping and more people qualifying for rental assistance, applicants are having to wait longer and look farther to find a place to live. The average time between an individual receiving a voucher and finding housing rose from 49 days in 2012 to 70 days last year, according to the Portland Housing Authority. In the first half of 2015, more than 13 percent of new housing-voucher recipients in Portland had to cross outside city lines to find an apartment, compared with 6 percent the year before. ane Footer, 60, spent three months crashing with a friend and then two months of near-sleepless nights at the city’s Oxford Street homeless shelter before she was able to secure a studio apartment in a subsidized senior housing complex in October. Footer and many others had to leave a string of apartment buildings on Wilmot Street in West Bayside last spring when they were sold to a landlord with plans to renovate what had become a blighted property. The new owner, Crandall Toothaker, said tenants were moving out of his nearby apartments on Pearl Street because of the drug activity coming from the buildings on Wilmot Street, so he decided to buy and gut them to attract a new kind of tenant. The 33 new apartments, which will feature hardwood floors and be surrounded by flower-filled courtyards, are intended to be affordable for middle-class residents – but won’t be for Footer. 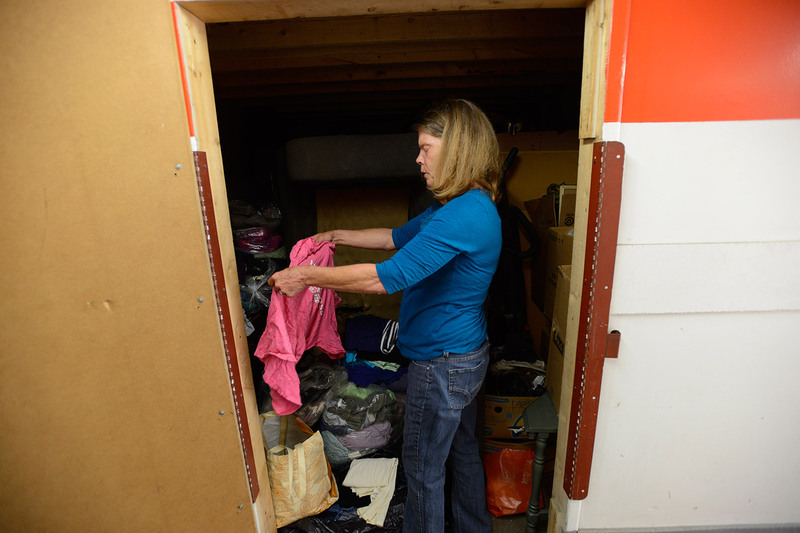 Although she has a Section 8 housing voucher that, with her disability benefits, would cover her rent, she struggled to find a place in town to use it. Footer, who recently overcame alcoholism and suffers from depression, knows that the shelter isn’t the best place for her to be. But with more newcomers moving into the city, she feels like there are few places left for people like her to live. “Frankly, they’d like to see us all out in Westbrook,” she said. esidential tenants aren’t the only ones who feel like they’re getting pushed off the peninsula. Cries of gentrification came with the closure last winter of Sangillo’s Tavern, a family-owned neighborhood institution on Hampshire Street in the East End. After the city denied a liquor license to the popular dive bar last year because of the number of police calls coming from the area, there were accusations of another motive behind the decision – that officials were trying to rid the city of such establishments in favor of more high-end businesses, such as the James Beard-nominated oyster bar across the street. Meanwhile, in the arts district, the volunteer-run Meg Perry Center was kicked out of its original location on Congress Street when the building owner wanted to remodel the space, now occupied by a cocktail lounge. The center moved into the basement of a sandwich shop on Market Street last year, but less than a month later was told its sublease was never approved by the building’s owner and it had 90 days to leave. Another new bar is now in that spot, and the Meg Perry Center’s chem-free meeting place and event venue never reopened. For 3G’s Tire & Auto Service, its departure from East Bayside in March was the third time in 30 years that it had to leave a location as a result of development. It moved from the corner of Washington and Cumberland avenues when the Big Apple gas station and convenience store came in, then was displaced from its new home down the street by a state Department of Corrections office. About a decade ago, the shop started leasing space on the corner of Fox and Anderson streets in East Bayside with the intention of buying the property. Those negotiations had just started last year when the building was sold for twice its appraised value to Redfern Properties, which has plans for a four-story building on the site with retail on the bottom floor and apartments above it. 3G’s moved to Veranda Street, just off the peninsula and across Back Cove from most of its customers, who used to walk from their homes on the East End to pick up their cars. “It was sad to leave the neighborhood because we knew all the people,” said Christy Hewitt, who owns the business with her husband. On the upside, however, they were able to afford a much bigger space and don’t anticipate having to move ever again. “It’s worked out,” Hewitt said. here is, of course, another side to the gentrification story. It can be beneficial for some businesses. Carlson & Turner Antiquarian Books found itself at ground zero of the phenomenon – where Munjoy Hill, East Bayside and the India Street neighborhoods meet. But owner Scott Wilson can’t complain. When he bought the business and building on Congress Street almost 20 years ago, his neighbors included a rough-and-tumble pub, a thrift store for veterans, a shoe repairman who lived illegally in the back of his shop and an apartment building frequented by the police. “The street was lively. There were a lot of people down here shopping, but it was a different group,” he said. As more housing and hotels were built nearby, new businesses moved into the strip of storefronts. “Every iteration has been a little bit different, a little bit higher-end,” Wilson said. A search through city directories over the past century shows how the long-standing strip of businesses has changed. In 1915, there were three drugstores within a couple blocks, as well as a barber and a sweets shop. Two decades later, there were four bakeries and two clothing cleaners. Later in the century, there were stores that sold electronics and used furniture. Now, Carlson & Turner is flanked by a yoga studio, a jewelry-maker, Ramen restaurant and a specialty pizza joint. Formerly a destination for traveling book dealers, Carlson & Turner started getting a lot more walk-in business about five years ago. So Wilson branched out into small antiques, such as vintage typewriters and old radios, to give shoppers more to look at and potentially buy. “Things sort of went crazy and are still going up,” he said. t’s not surprising that this summer was Wilson’s busiest yet, as residents moved into new luxury town homes off Washington Avenue and high-end condos just up the hill. The newcomers pass by his shop when they walk downtown. Neither of those projects replaced existing apartments. They added to the housing stock, potentially freeing up other units for the less affluent to fill. Building more housing is the only way to combat the drawbacks of gentrification, said Charles Colgan, the former state economist and a professor of community planning and development at the University of Southern Maine. But with limited land on the peninsula, where people coming to Portland want to be, support for such projects could be hard to come by. Development in places like Bayside, where the proposed “midtown” project would add hundreds of housing units, is easier in theory because there’s vacant land to build on – and even that project has gotten enough backlash to nearly kill it. Once developers have exhausted those options, Colgan said, they’ll have to start looking to add density. “The next generations of gentrification … will be more disruptive,” he said, because it will involve more existing single-family homes being replaced by multifamily buildings. “That’s going to be an epic battle,” he said.